Cook fettuccine according to package. Drain. While fettuccine is cooking, prepare chicken. Heat 12-inch skillet; add 2 TBSP butter. Roll in flour, add to skillet. Cook and brown until juices run clear, about 10 minutes. Add to skillet 2 TBS butter, onions, and garlic. Add cream, cook for 3 minutes until reduced a bit. Add cheese, parsley, and red pepper flakes. Stir well. Add last 1 TBSP butter and stir well. Bring back chicken and coat with sauce. 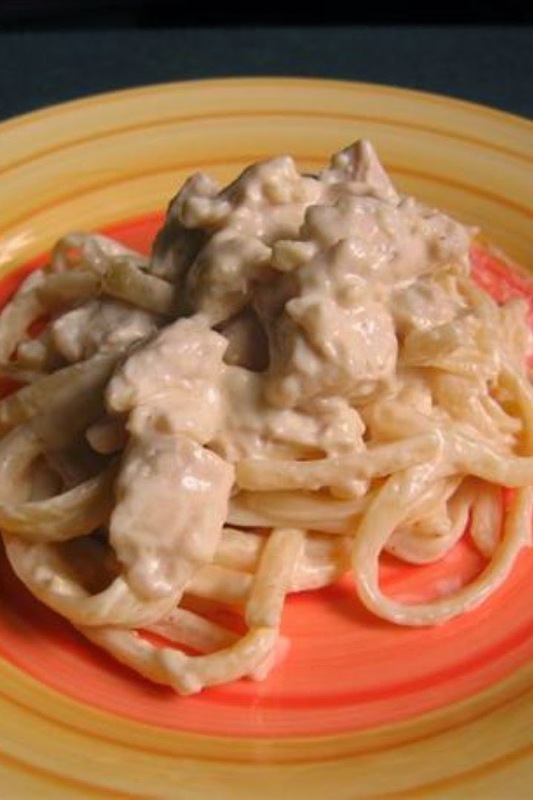 Place chicken on plates, put fettuccine in sauce and swirl around to coat well. Add to plate with chicken.